Chicago, IL: Bellows-Reeve Co., 1909. THIS COMPLETE SET IS STILL IN THE ORIGINAL BOX IN WHICH IT WAS SHIPPED FROM BELLOWS-REEVE. Some original paper wrapping the individual volumes is intact. 10 volumes plus guide, vol 10 is dated 1913. vol. 1 has some evidence of pages formerly bent, page 15 torn. vol 2 has previous owners (child) name and doodle on ffep. other volumes appear unread. save these imperfections the set appears new - gilt is unfaded, corners square and bindings tight. very scarce in this condition, a remarkable set. Size: 8vo - over 7¾" - 9¾" tall. Hard Cover. Near Fine/No Jacket. Chicago: Bellows-Reeve, 1922. Hardcover. Very good. Bound in the publisher's original black cloth, stamped and decorated in blind and gilt on the covers and spines. Top edges gilt. Rubbed edges and extremities, frayed head and heel of volume one. 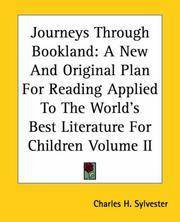 Journeys Through Bookland: A New and Original Plan for Reading Applied to the World's Best Literature for Children. Complete in 10 Vols. Chicago: Edwin Bellows, (1922).. Complete in 10 Vols. with Guide. Original black decorated cloth. Vols. 2-9 are Near Fine. Vol. 10 has a trace of edge wear and is Very Good. Vol. 1 has some spotting on the title page, is cracked there, has some wear at the foot of the spine, and has one leaf with a large corner chip (text not affected), Good. Nice color illustrations in the volumes. . Very Good. Hard Bound. New (Fifteenth) Edition. 1922. 2008-10-30. New. Ships with Tracking Number! INTERNATIONAL WORLDWIDE Shipping available. Buy with confidence, excellent customer service! Chicago, Illinois: Bellows-Reeve Company. Very Good with No Dust Jacket as issued. 1922. First Edition: First Printing. Hard Cover. 012610: Volume One is the most worn (in Good condition) with wear at top/bottom of spine and board corners and a corner of front label removed. Front and back hinges have been neatly repaired with paper tape. Volumes Two-Ten are in Very Good to Good condition, with varying amounts of light-medium wear at board corners. No writing or names found inside, except for prior name and date (Dorothy Lou Simpelaar Sept 29, 1931) on half title page of Volume One. Otherwise, boards and pages are clean, unmarked, bright, tightly bound (except as indicated) and sharp cornered. Scarce, Out Of Print, Book. Boards are Dark Pebbled Red with gilt lettering on spines and full-color paper labels (with large ship and title) on fronts; all are matching as a Set. Books contain many, many color as well as black-and-white illustrations throughout the hundreds of long and short children's stories. Each Volume contains between 482-500 pages each and measures 6.25 x 8.75 inches. A beautiful historical set of children stories. : 6.25 x 8.75 in. : 4,912 pages . 20100325. Good. Ships with Tracking Number! INTERNATIONAL WORLDWIDE Shipping available. May not contain Access Codes or Supplements. May be ex-library. Shipping & Handling by region. Buy with confidence, excellent customer service! Chicago: Bellows Reeve, 1909. 11 volumes with the guide, a beautiful first edition with the gilt decorative backstrip and title with decorations on the covers. Colored frontispiece on each volume. Volume 1's backstrip is lightly rubbed. The guide book has a stain from an old bookmark; its on the blank front free page. I include that bookmark as it is nice. A poem by Ella Wheeler Wilcox is on the red bookmark. First Edition. Decorative Cloth. Near Fine. 8vo - over 7¾" - 9¾" tall. Children's Stories. New York: Harper & Row, Publishers, 1975. Number line: 75 76 77 78 79 10 9 8 7 6 5 4 3 2 1. Title copyright date, 1972. Vol. I - Preface by Frederick Anderson (Editor of ' The Mark Twain Papers '. Mark Twain: A Biographical Summary by Albert Bigelow Paine ( Twain's literary executor). 4 complete books and 14 selections from assorted writings by Twain. 650 pp. Book has lightly bumped bottom front corner and slight spine wear. Vol. II: Preface by Mark Twain. A Word of Explanation. A Connecticut Yankee in King Arthur's Court. pp. 654 - 1462. Spine has similar wear common to heavy, thick books. Green slipcase carries no text . It has light edge/shelf wear. Both text blocks are as new. Introduction: " ' The Family Mark Twain ' is far more substantial than an introduction to the author's writings or a collection of his ' best ' pieces, for it assembles a substantial library of his collected works upon which those international expressions of esteem and affection enriching his last years were based." The complete set weighs close to 6 lb. and will necessitate extra shipping costs. Only indication of BCE is small publisher's colophon (square indentation) at base of rear spine. Bookseller's Inventory # 170346.. True First Edition thus, 1st Printing. Duotone Cloth Covered Boards. Fine/Near Fine Slipcase. 8vo - over 7¾" - 9¾". BOMC Bce Edition. 20040617. Good. Ships with Tracking Number! INTERNATIONAL WORLDWIDE Shipping available. May not contain Access Codes or Supplements. May be ex-library. Shipping & Handling by region. Buy with confidence, excellent customer service! 2017-08-19. Good. Ships with Tracking Number! INTERNATIONAL WORLDWIDE Shipping available. May not contain Access Codes or Supplements. May be ex-library. Shipping & Handling by region. Buy with confidence, excellent customer service! Chicago, IL: Bellows-Reeve Company, 1932. 4 red & 6 green volumes w/embossing and gilt titles; top edges gilt; gilt titles...very nice set, clean, unmarked pages. Hard Cover. Very Good/No Jacket. Illus. by Illus. 8 Vo; 20 Pounds. Journeys Through Bookland: A New and Original Plan for Reading, Applied to the World's Best Literature for Children. Eleven volumes including Guide. Bellows-Reeve, 1909. Minor wear to upper spine tips, overall near fine with all hinges firm. Color frontis to each volume as well as hundreds of black & white text and full page illustrations throughout. Condition: Minor wear to upper spine tips, overall near fine with all hinges firm. 2008-10-30. Good. Ships with Tracking Number! INTERNATIONAL WORLDWIDE Shipping available. May not contain Access Codes or Supplements. May be ex-library. Shipping & Handling by region. Buy with confidence, excellent customer service! Bellows-Reeve Company. Hardcover. 221786 Complete ten volume set [10 volume set]. Volumes I-X. Octavo. Red leatherette covered boards with gilt stamped lettering and blind stamped decoration to spines; Blind stamped design and embossed lettering to front boards. Illustrated blue endpapers. No publication date stated. Copyright 1939. . Good. 1939. Bellows-Reeve Company. Hardcover. 139184 Complete ten volume set: vols 1-9 plus Guide. Red clothbound covers with blind stamped illustration of ship and title on front board; gilt lettering on spine. Illustrated blue endpapers, full colour frontispiece and a mix of colour and B&W illustrations throughout. All volumes in Very Good condition. . Very Good. 1939. Bellows-Reeve Company. Hardcover. 221786 Complete ten volume set [10 volume set]. Volumes One-Ten. Octavo. Black cloth covered boards with gilt lettering and decoration on fronts and spines along with blindstamped decoration. Brown illustrations on white endpapers. Coloured illustrations throughout as well as frontispieces. . Good. 1922. Chicago: Bellows-Reeve Company, 1922. Very Good/No DJ. 12mo = 7-9". Ten volume set which includes Guide. Condition is very good with expected wear at corners and sides of binding. A new and original plan for reading applied to the world's best literature for children, circa 1922. Toronto: Edwin Bellows Company, 1922. More than 480 pages in each volume. Gold lettering on the spine and decorative front covers, with blind embossed decorative border to front of patterned cloth. Top fore edge gilded. Previous owner's name on the first white page of the first volume. Volume 3 - the hinges are beginning to crack. Volume 8 - front hinge is cracked. All volumes are illustrated with b/w and full colour illustrations. A very good copy of this complete set. This is a heavy set and will require additional shipping charges. . New Edition. Black Cloth Hardcovers. Very Good+/No Jacket. 6 x 8.5. Children's Literature. United Educators. Used - Good. Shows some signs of wear, and may have some markings on the inside. Bellows-Reeve Company, 1939-01-01. Hardcover. Good. COMPLETE SET OF 10! Text in mint/unmarked condition. Covers show wear with bumped/scuffed corners, have minor discoloring and are warped from bad storage. Binding is tight. Your Satisfaction Guaranteed. We ship daily. Chicago, IL: Bellows-Reeve Company, 1939. The covers show some wear with rubbing. The text is clean with no markings. . Hard Cover. Very Good/No Jacket. Chicago: Bellows-Reeve Company, 1932. Hardcover. 8vo; VG- hardcovers without dust jackets; blue spines with gold text; the 10 vols. are in uniform condition; boards are moderately shelf-worn with bumping to the corners and tips and rubbing to the edges but boards are in tact; text blocks are moderately tanned to the edges and pages are slightly discolored otherwise clean and legible; 489p. (Vol.1); 493p. (Vol.2); 488p.(Vol. 3); 492p. (Vol.4); 497p. (Vol.5); 482p. (Vol.6); 486p. (Vol.7); 492p. (Vol.8); 493p. (Vol.9); 514p. (Vol.10). FP New Rockville Stock. Chicago IL: Bellows-Reeve. Good+ with no dust jacket. 1909. Hardcover. All volumes show light wear at the spine ends with volume 1 having a small repaired tear to the spine top. The content text block of all volumes is very good although volume one shows heavier use and contains a 32 page section which was printed on paper with a high acid content and is yellowed and a bit fragile. ; 8vo 8" - 9" tall . THE UNITED EDUCATORS, INC. 1959. Used - Acceptable. Former Library book. Shows definite wear, and perhaps considerable marking on inside.